Asanga (also called Aryasanga), born around 300 C.E., was a great exponent of the Yogacara. Born in Gandhara in north India as a Brahmin’s son, he was perhaps originally a member of the Mahīśāsaka or the Mūlasarvāstivāda school but later converted to Mahāyāna; after many years of intense meditation, during which time some traditions say that he often visited Tushita Heaven to receive teachings from Maitreya-nātha. 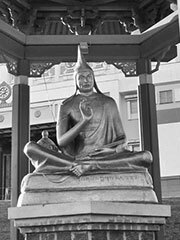 He went on to write many of the key Yogācāra treatises such as the Yogācārabhūmi-śāstra, the Mahāyāna-samgraha and the Abhidharma-samuccaya as well as other works, although there are discrepancies between the Chinese and Tibetan traditons concerning which works are attributed to him and which to Maitreya-nātha.